Teachers of martial arts don’t freeze frame into an expectation others have of them, especially across the span of a long career. Yes, teachers of good character will often fulfill the trust of their students and remain teachers of good character. Teachers known for their excellence in certain areas of their art will hopefully continue, and even expand, their areas of excellence. But they are still human, and the course of their life does affect them. Consider the mass of instructors whose lives were utterly changed by revolution and war in the first half of 20th Century China, Ip Man of Wing Chun fame being at present probably one of the more famous. Ip Man arrived in Hong Kong with a deep martial foundation which he then adapted to the generations of students he taught. Through Ip Man, the system referred to as Wing Chun learned to adapt to Hong Kong. Back in Foshan, the system adapted to different needs. Ip Man’s hands became Hong Kong hands, and as the decades unfolded, Ip Man’s Hong Kong hands changed too. 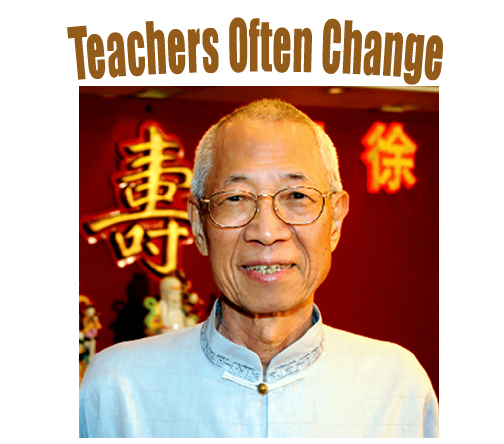 Teachers change because of the range and type of students that present themselves at their door; teachers change because they draw on new insights discovered within their art or through the influence of others; all teachers change because of age, health, economics, life style, personal opportunities and a change of outlook in their own personal training. Teachers weaken in some areas and become stronger in others. Martial politics affect teachers. They may change their teachings and their techniques due to necessities on the political level. Almost every art has been besieged by politics, and the teachers of these arts stand at the wheel of the ship. The wave that hits the prow sometimes cries out: “Change or be changed!” Change….or be changed. It is after all, politics. Every teacher indeed does change. My teacher in Jiu Jitsu, Shihan Ron Forrester, began his career with straight and strong Japanese Jiu Jitsu. Soon though, he began exploring the other arts, bringing in well-known practitioners as diverse as Bill Wallace of Karate/Kickboxing fame and Jim Arvanitis from Pankration. The result was an unprecedented five world championships for his Canadian teams. Then he left the sports rings and devoted his training to personal self defense which he was constantly improving and updating right to the time of his passing. Forrester never ceased exploring. He looked into Judo, Boxing, Tai Chi, in fact he even did a type of push hands which emphasized locks and throws. My Kung Fu teacher, William K.Y. Chau, introduced us heavily into the forms and fighting of My Jong Law Horn. Then he began emphasizing Hsing I, its five fists and twelve animals, not to the detriment of My Jong, which never took a back seat but it was just an interest he wanted us to explore, and so we did. As he advanced a little in age, we began exploring I Chuan. Everything felt natural; nothing dominated. We treasured, and we explored. Which brings me to this lovely video clip of Chu Shong Tin. I don’t train in Wing Chun but I do have a deep respect for it. Chu Shong Tin apparently was Ip Man’s third student in Hong Kong. Born in 1933, he passed away just last year. What is to me remarkable about the video clip is that this Wing Chun teacher of many decades discusses his evolution as a teacher vis a vis his students and he does so honestly. Please don’t think only Kung Fu when you watch this clip: it affects all of us, from Aikido to Savate. Teachers are beings of exploration. They invite us to join them on the road. It’s one of the main things that makes the martial arts so deeply interesting.